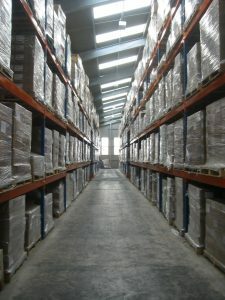 Our clerical staff are able to manage the stock that you have at our warehouse. At short notice you can receive stock reports enabling you to make decisions about how you are going to manage those stocks. We provide load consolidation and splitting services from our warehouse giving you maximum capability to efficiently control the flow of goods across your supply chain. The high capacity of our recently extended 64,000 square foot (6,000 square metre) warehouse means that we can cope with the variation in capacity needed by your business. We utilise both Reach Trucks and conventional Forklifts to ensure that we have the best tools to support us in our operation. Our Lift Trucks are able to access ISO containers via loading docks, ensuring that we have the full range of abilities required to cope with your cargo needs. 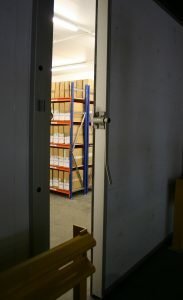 In 2008 we added a humidity and temperature controlled storage facility for the storage of climate sensitive goods such as X-ray images (used for quality control by some of our customers). 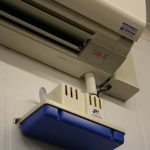 The temperature of the facility is held between 16 celsius and 20 celsius and a relative humidity of between 35% and 55%. In May 2010 (and updated since) J B Wheaton and Sons was issued with a “Warehousing and storage – Ambient” licence from the Soil Association to confirm that we meet organic standards for our warehousing operation. View our location to get an idea of how we can fit in with your geographical network needs. Contact Mark Wheaton, our Warehouse Services Manager, from the form on our contact page or by simply phoning 01460 220531.